It’s true, there are a lot of good musical, social, and spiritual reasons to have a church choir. 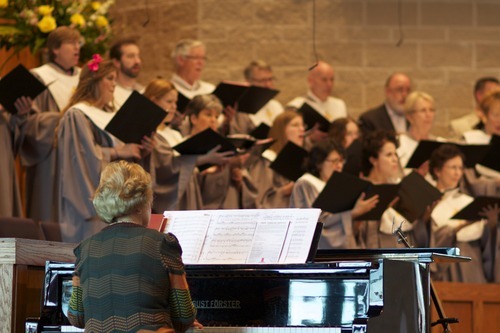 As another friend recently reminded me, choirs are the quintessential “small group” of the church, offering tremendous opportunities for worship, edification, and spiritual growth. And this is all true and important. But to me, the most compelling reason to have a choir is simply because it was God’s idea. From the early beginnings of organized Temple worship (2nd Chronicles 5:13, see the whole chapter), to the mass choir of eternal worshipers (Revelation 7:9-12), God has implemented, accepted, and enjoyed the ministry of the choir of believers. Can a modern church truly be a New Testament church without the ministry of the church choir? Sure. Church plants and small congregations may find it to be low on the list of their immediate priorities. But eventually, as a healthy church grows numerically and spiritually, it would be wise to evaluate the validity of the church choir (even if it could really be called an ensemble). And it would be a good idea… because it was God’s idea. I am interested in reading the article you referred to from your friend about why it’s a good idea to have a church choir. Is it possible for me to get that? I certainly understand you point about it being God’s idea, and I totally agree. Please let me know if I could get a copy of that article. Thank you for your website. I really enjoy your posts. Hi, Doug, and thanks for writing. Sorry I can’t help you there. I don’t know where that article is, but I’ve seen several articles like that over the last few years. As you can imagine, I receive many articles like this. I’m glad to see a renewed interest in church choir these days! Ok, thank you. I appreciate letting me know.